Jon Riccio: Congratulations on winning the 2013 Lexi Rudnitsky First Book Prize in Poetry, which led to the publication of Inside Spiders. What drew you to this contest? Leslie Shinn: Thanks! It was thrilling to win. Since I’d been sending my manuscript out for a while, I think I knew about most of the contests, and had submitted to many of them. I was interested in Persea first because it is a fine press, and because the Rudnitsky Prize was for women. The prize also offers its winners a generous six-week stint at the international artists’ retreat in Civitella Ranieri in Italy. I will be going next summer! JR: You attended the low-residency MFA Program for Writers at Warren Wilson College. How was your work/course load structured? What do you value most about your low-residency experience? LS: I attended ten-day residencies each January and July at Warren Wilson during the two years of my degree program. At residency we were assigned a faculty member to work with in the following months, and though each faculty had slightly different expectations, the usual work load was to send to him or her several annotations on books from a list we’d worked out together, along with several new poems, every three weeks. Besides all the course work for the four semesters, we were also required to make a book-length manuscript of poems. Additionally, we wrote a long scholarly paper that was approved in committee, and prepared a class on one of our themes or interests, which we gave to our fellow students during our last residency. At graduation, we gave a reading of our work. When I was a student at Warren Wilson, I was a single mother working full time. The program was demanding, to say the least, but it was also energizing and fulfilling. It gave me confidence in my writing. I began to be less self-restrictive in the act of writing – out of the necessity of having new poems to send in those packets! – and began to compose less deliberately and carefully – notes scribbled hurriedly on receipts or any scrap to use later; that sort of thing. That was very freeing and permanently changed my approach to the page. JR: Have any aspects from your job in the Undergraduate Biochemistry Program at the University of Pennsylvania influenced your poems? library – a truly wonderful benefit. JR: Inside Spiders is my current go-to for the compressed poem. There are many great examples – “Skit,” “Taking Pills,” “Sweep,” “Glance” and “Station” – among them. What specifically about compression resonates with your aesthetic? LS: Having found such poets as Dickinson and H.D. very early, my aesthetic was formed with a minimalist tendency. My poems are constructed such that their brevity is elemental, primary to the expression. I do strive, though, to assure that the poem’s scope is not foreshortened in finding the expression’s most succinct summary. Lately I have sought to develop fluency, mostly in terms of a poem’s movement and area, both imaginatively and down the page. I am aiming at a new kind of construct, an expanded, less fitted articulation, poems that may be more loosely jointed but are still skeletal. JR: “Three” won me over with its use of white space. I’d love to hear your thoughts on this technique. LS: “Three” is a newer poem relative to the rest of the manuscript. My new poems are like “Three” in that they have less punctuation, and are arranged less often in fixed stanzas but rather in ways that seem to fit the expression. It was important to me that this poem read slowly, or in a calmed, untroubled way. Arrangement is usually pretty intuitive. In contrast, “Actual Fiction,” which similarly has unmatched stanzas and some lines that trip across the page, was arranged to seem antic and headlong, to match its rather reckless tone. JR: “Trap” reminded me of Emily Dickinson (“clover heads that float in the bowl near my cup/ in these mornings near winter, when death is a good start”). Who are some of the poets that continue as travel companions on your artist-journey? JR: Your poems capture the exquisiteness of spiders. If you were to write in a received form (i.e. tanka, sonnet, pantoum, etc.) about an extinct animal, your selection and species would be? LS: I would write a dinosaur poem…with pterodactyls! JR: “Compline” has a definite origin: All Saints Convent, Catonsville, Maryland, where “one/ candle cup hangs, white sustenance,/ tangent to the moon.” You derive your greatest sustenance from the interior or the exterior? LS: I am fascinated with nature but wildly prefer passive involvement. No hiking or camping or anything like that! I have always been the kind of person who could be found in the house with her nose stuck in a book. JR: Inside Spiders’ longer poems, such as “The Little Queen,” “Night House,” and “Drowned,” are sectioned by Roman numerals. What are your criteria for segmenting a poem? LS: I make small pieces of an intended whole to change voice or to swerve wider than might be possible simply line to line. I generally understand early that my method will include sections. I think of them as rooms, or as separate spaces arranged for through-movement in sequence. JR: I’ve paired the first four words of Inside Spiders with the book’s final line: “He had forced flowers deep on the stair and still, still the world…” How would you conclude this? 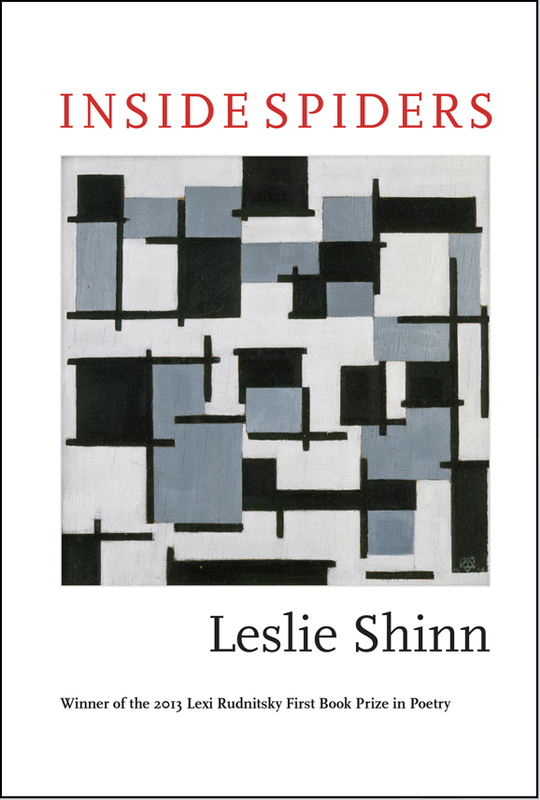 Leslie Shinn received her MFA in creative writing from Warren Wilson College. She was born in Des Moines, Iowa, and lives in Philadelphia. Jon Riccio is a current MFA candidate at the University of Arizona. Forthcoming poems will appear in Waxwing, Switchback, Paper Nautilus and Jet Fuel Review.